Mr. Tariq Iqbal Puri (center), chief executive of Trade Development Authority of Pakistan (TDAP) poses with Pakistani Ambassador Shaukat Ali Mukadam (to his right), Dr. Kim Young-Il (to his left), honorary consul general of the Pakistan Embassy in Seoul, and Attorney at Law Chang Wan-Ick (right) of Haemaru Law Firm & Notary Office. 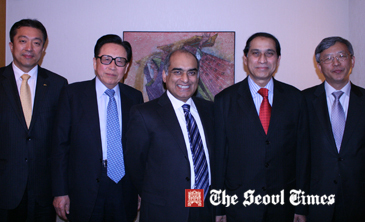 At left is Mr. Hebert Lee, managing director of Korea Importers’Association at Pakistani Embassy in Seoul. Mr. Tariq Iqbal Puri, chief executive of Trade Development Authority of Pakistan (TDAP) visited South Korea from April 5 to April 8, 2011. He also said that even though China is very important in business ties with Pakistan he wants to upgrade trade relations with South Korea to the level of strategic partnership. The top Pakistani trade official urged more South Korean businesses to advance into the Pakistani market, even though there are already many Korean companies operating in Pakistan. “Even decades of years ago South Korean companies bravely went to our country for business,” he praised enterprising spirits of the Korean firms. Pakistani Ambassador to Seoul Shaukat Ali Mukadam hosted a dinner for the visiting top trade official at his residence in Seoul on April 7, 2011. Mr. Tariq Iqbal Puri (center), chief executive of Trade Development Authority of Pakistan (TDAP) poses with Dr. Kim Young-Il (to his right), honorary consul general of the Pakistan Embassy in Seoul, Mr. Hebert Lee (tohis left), managing director of Korea Importers’Association at Pakistani Embassy in Seoul, and with General Manager Faisal Hag Khan (right) of National Bank of Pakistan (NBP). At left is Ms. Shin Jung-Min of the embassy. 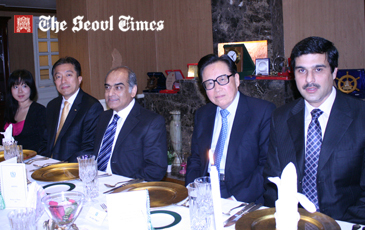 Others to be invited to the residence dinner are Mr. Hebert Lee, managing director of Korea Importers’Association; Mr. Faisal Hag Khan, general managerof National Bank of Pakistan (NBP); Dr. Kim Young-Il, honorary consul general of the Pakistan Embassy in Seoul; Attorney at Law Chang Wan-Ick of Haemaru Law Firm & Notary Office in Seoul's Seocho-dong, and Mr. Joseph Joh, managing editor of The Seoul Times. From the embassy side, Commerical Counsellor Fuad Hashim Rabbani as well as Amb. Mukadam joined the traditional Pakistani dinner. A variety of Pakistani dishes were served during the dinner. He attended the Second International Planning Meeting for "EXPO 2012 Yeosu Korea" to be held at Shilla Hotel on April 5-8, 2011. During his stay in the nation Mr. Puri also had a series of meeting with various business leaders of Korea. In particular, he met with Mr. Sohn Kyung-Shik, chairman of the Korea Chamber of Commerce and Industry (KCCI) on April 6, 2011. On April 8, 2011, he had three separate business meetings with three local businessmen. Mr. Puri met with Mr. Kim Tae-Hyung, CEO of Sae-A Trading Co. at Park View Restaurant of Shilla Hotel in Seoul. He also met with Mr. Seong Ki-Hak, chairman of Youngone Trading Co. and with Mr. Woo Jong-wan, CEO of "The Basic House" to discuss ways of promoting business ties between the two countries. On April 7, 2011 Mr. Puri made an inspection tour to the Expo site in Yeosu, South Jeolla Province. He attended a luncheon to be hosted by Yeosu Mayor Kim Chung-Seog on the day. Who Is Tariq Iqbal Puri? 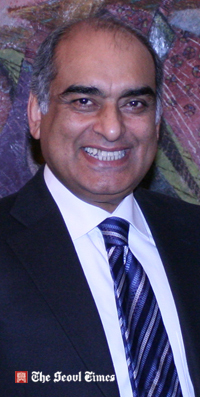 Mr. Tarig Iqbal Puri was appointed to his current post of chief executive to Trade Trade Development Authority of Pakistan (TDAP). Prior to his appointment he was serving as federal secretary at the Ministry of Labour & Manpower and Ministry of Investment / Board of Investment. Mr. Puri has been highly credited for serving for Pakistan’s federal government for the last 37 years based on his vast experience in both government and business sectors. During his three decades of public service he has accumulated extensive hands-on experience in Pakistan’s multilateral and bilateral trade. In particular, Mr. Puri has demonstrated his ability as an expert in attracting foreign investment into Pakistan. He is widely regarded as a chief trade negotiator for his country. While as federal secretary at the Ministry of Labour & Manpower and Ministry of Investment / Board of Investment, he showed great vision to its people as a top policy maker. When he was at the Pakistani Mission at Brussels his active campaign as Pakistan’s chief trade negotiator was impressive in dealing with the 27 member states of European Union (EU). His achievements included lifting of anti-dumping duty on bed linen export, securing economic assistance and customs co-operation. Aside from his strong performance as chief executive of Trade Development Authority of Pakistan (TDAP) in promoting and facilitating the exports of Pakistan, he showed a great ability as a key member of the team responsible for forming the trade policy of the Commerce Ministry. Mr. Puri also served such overseas posts as Hong Kong and Turkey’s Istanbul. He was a head of mission (consul general) at Pakistani diplomatic mission in Hong Kong. He was also a deputy head of mission (consul general) at Pakistani Embassy in the Turkish capital. He also served as director general of the Textile Quota Management Department, Karachi, and as director general of Export Promotion Bureau in Punjab. Mr. Puri also worked as executive director of State Life Insurance Corporation and as controller of Imports & Exports in Islamabad. He earned his MBA from University of Louvain in Belgium. He also attended the executive leadership program at Harvard University’s John F. Kennedy School of Government in the United States.